Are you having problems with your free WordPress theme? Unfortunately, I was! So I started having a look around at the Premium themes and trying to decide if I should go down the paid route and if so which paid theme is best. 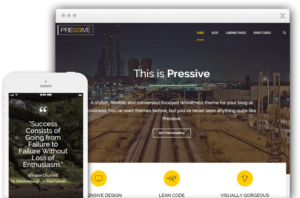 Here’s a summary of what I found out and why I chose to move to a premium theme with the Thrive Themes Review 2019. I do not generally advocate for brand new affiliate marketers to go with a Premium theme (read you have to pay for it) and I haven’t changed my mind in that regard completely. But I figure it’s always good to know what’s out there for the time when your website is paying its way or you come across some extra cash you want to invest in your business. Or as is my case your free theme just isn’t behaving itself and you need to consider some other options. My beautiful black and white theme for the Rat Race website was causing all sorts of Google crawl errors mostly it seems when it came to images. You will know if you’ve had much of a look around my website I am pretty keen on images and my Google stats tell me already I have 91 images and depressingly 91 errors! Understandably free themes don’t come with a whole lot of support from their developers which often times is fine as long as the theme you have chosen is robust and doesn’t have any gremlins in it. Well, I seem to have lucked out in this regard because my old free theme had some seriously nasty gremlins. Anyway enough of my sad story so I did end up going with Thrive Themes and that’s what you are looking at now. The Rat Race Escape Project is now running Thrive Architecture and their theme called Pressive. For complete transparency, I am an affiliate of Thrive Themes, only because I feel their product is one of the best on the market and after I tried it I joined up to be an affiliate. My aim here at The Rat Race Escape Project is to provide you with all the information about the best products around so that you can make an informed decision. Note: Also your membership never goes up, so if you buy now at $19 per month, it will always be $19/month no matter what other price rises happen. Now that’s pretty cool. Integrates with all the major players eg. Facebook, Google, Amazon etc..
Limited themes to choose from, currently 10 but they do have something for everyone and each one is customisable you can get pretty much a look and feel you want anyway. Promoted as Your All In One Online Business Toolkit Thrive themes is squarely targetted at online marketing / affiliate marketing websites. The plug-ins that come with your Thrive membership make so many others redundant. This can seriously help to speed up your website, and as we know in our fast-paced online world no-one wants to wait for a page to load. Thrive Themes is not just a WordPress theme it is a complete software package to run your affiliate marketing business. This is the drag and drop page builder which is the core element of the Thrive Themes stable. This editor makes creating a beautiful website simple. One of my biggest bugbears is having everything perfect layout wise in WordPress and then when you hit the publish button you have text running onto other lines, no spaces where you really wanted them, images that have resized and your whole carefully planned layout ruined. I can attest that with my old free theme what you see is definitely NOT what you get. I then needed to fluff around going from the published page back to WordPress to guess at correct sizes and mess with code to get the page to look somewhat like what I was after. Most annoying. So being able to get my posts and pages to look exactly how I want is a huge drawcard for me. Much is made within beginner online marketing training about how your site doesn’t need to look flash to make money. And this is true to an extent. Far more important is your content which needs to be informative, engaging and written to build trust with your visitors. I am assuming as you have found your way to the Rat Race Escape Project you are a savvy, switched on affiliate marketer and know how to write brilliant content. If you do wish to brush up your content writing skills you can check out my blog to give you some handy hints and tips. But let’s say you are writing fantastic content which is getting ranked high up in the search results, the visitor clicks onto your page and sees a difficult to read, poorly laid out website which looks cheap and a little nasty! They are probably not going to stick around to read much of your content. A great theme will have built-in correct size fonts to enable easy reading, an engaging layout which provides suitable amounts of white space and encourages a smooth flow as the reader progresses down the page. So while the look and feel of your site are not the “be all and end all” there is no reason why you can’t have a great looking site to build your business on. While Thrive only offers 10 themes at this stage, they are promising a brand new theme going into Beta testing soon which does look to be quite special. In the meantime, the existing themes look great and use a drag and drop editor so you can customise your site to your heart’s content without needing to know any tricky coding. I particularly love the theme I chose which is Pressive and choose the Minus theme for my niche site. This is the beauty of being a member you can access all the themes for all your different sites at no extra cost. It’s not always one size fits all. You can check out their video on how to build not only a beautiful home page but one that converts below. This is an area I am yet to play with for my websites but it is fast becoming something I need to learn and get set-up. 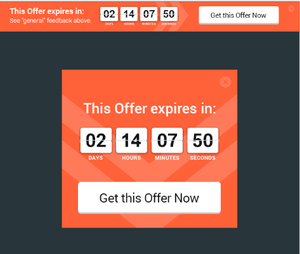 Landing pages are very specific targetted pages that feature one call to action. They are not content pages like this one you are on they are purely for the purpose of directing the visitor to an action. This may be to sign up for a program through your affiliate link as will be in my case. It might be to offer the free bonus you have created to collect email addresses or simply a super duper sale where you direct the visitor straight to a purchase. With over 220 customisable templates for landing pages, Thrive is super easy for those, like me, with little creative flair to build a stunning landing page which would convert. I really love the landing page templates included with the Pressive theme and that’s what I will be using for upcoming promotions on this site. Thrive also provide a Beginners Guide to Landing Pages which you can access by clicking here. Thrive Leads provides you with beautiful templates to create Opt-in forms for your site. Many long-time marketers recommend you start as soon as possible collecting email addresses from your visitors. If your site is engaging and interesting enough people will want to subscribe to receive your weekly blogs and you should offer this early on so as not to miss any opportunities to start list building. You do not need to offer a FREE gift or enticement to start collecting subscribers. Later down the track you may wish to create an offer of sorts, an E-Book is commonplace but there are many other freebies or gifts that can be offered. Yep it’s another one of those non-descriptive online marketing terms. It sounds fancy but A/B testing (also called split testing) is simply creating two versions of a web page or an advert and testing to see which one performs better for conversions. Every page or post you create you want your visitor to do something. It may be to click on an affiliate link, sign up for a newsletter, leave a comment to encourage further engagement or click onto another page so they remain on your website. By creating two versions of the page you can test which page appeals most to your audience. Do they sign up more when they see Page A or Page B? Obviously you want to make the most of your web pages but more than that it can be expensive to buy traffic, source organic traffic is a slower but cheaper method of increasing eyes on your site but ultimately you will be a lot better off if you can increase conversions from the traffic you already have coming to your website. So you want to make the most of every page and A/B testing can show you. While you can outsource if you do not have the skills to do split testing, but with Thrive Optimise you can do this within your WordPress dashboard making it easy and saving you money on outsourcing. Learn more about A/B testing by clicking here. It doesn’t need to be super complicated, check out the video below to see how you can do it with Thrive. To build trust and rapport this is a nifty little add-on to the Thrive stable. 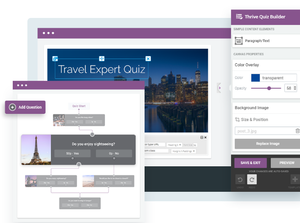 A quiz form enables you to engage with your visitors by asking them a question. Their answers can be used to tailor specific blog posts you may be thinking of writing or opt-in forms which can increase your chance of people signing up for newsletters, weekly updates etc. As an example we will use my horse help niche site. I might put a quiz up asking – What is more important to you a) being able to catch your horse or b) being able to lead him onto a trailer? Let’s say 80% of people pick b) then I know I could create an Opt-in form which says – Find Out How To Teach Your Horse To Load Onto A Trailer Today. Our 4 step guide will get your horse into the trailer in minutes everytime. One would think you are more likely to get signups than going for How To Teach Your Horse To Be Caught because more people are interested in trailer loading. Simples! Quizzes are also very popular for sharing around Social Media especially if you can write a topical or controversial quiz question. It is worth putting your thinking caps on about what sort of quiz questions you could use on your website. I reviewed a site the other day that was using a Thrive quiz just as an engagement with reader tool, it was actually really fun and I enjoyed completing the quiz and the follow-up score from the website. Just another nifty way to engage your audience and one I will be introducing soon to both my sites. Thrive Ultimatum – Don’t Miss Out! If you like to go down the time is running out, countdown timer route then Ultimatum is for you. I could definitely see if I was to run a super special that has a sign-up deadline this would be a great tool to include on a specific landing page. At Wealthy Affiliate they offer a Black Friday Sale each year, this is a fantastic promotion where you get Premium membership at a greatly reduced price, but it only lasts for a few days. This would be a great campaign to create a new landing page for and use the Ultimatum clock to encourage action. This has proven to be an effective incentive for those people who are sitting on the fence about your offer and is included in the Thrive membership. Do you want to offer online training for your visitors? I must say this isn’t something I have given a lot of thought about at this stage but on researching how Thrive offer this option it may be something to consider moving forward. You can create training courses within WordPress which could then become your free offer via your Opt-In forms. Or take it to a whole new level when joined with the membership plugin you can offer paid courses as part of a membership scheme all with the same look and feel as your website. People trust people and the more testimonials you can gather about your website, products offered or services the more conversions you will make. Testimonials are akin to word of mouth referrals if people can see that others have been satisfied via your site they are more likely to commit themselves. If like me you cringe at the thought of having to ask for testimonials, it feels all to salesy, then Thrive Ovation is for you. This feature allows you to build custom capture forms across various areas of your site and then set and forget so they are always there, front and centre when a satisfied customer wishes to provide a glowing testimonial. 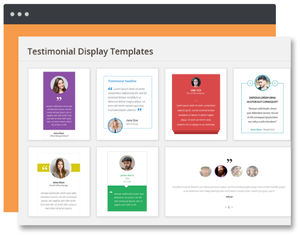 It also makes it super easy to catch testimonials from your Social media sites and keeps it all organised and easy to access for any spot within your site you need to add a testimonial. Heaps of different templates also make it dead easy to customise a look right for your website. Thrive offer a Knowledge Base which is essentially an online instruction manual covering every aspect of their membership. On top of this you get access to the Support Forum for quick responses from other members and if all else fails you can send a ticket to their Site Support who will help you out. Ongoing education to enable you to really get the most out of the tools offered is through Thrive University, online courses, monthly webinars with live Q&A’s with the Thrive team as well as the regular team blogs to keep you up to date. Every element of the package is extensively covered so you don’t need to wait for the webinars to get your site ticking over. If you want feedback on your site from the experts the Thrive team offer member website reviews through webinars and blog posts on a regular basis. Thrive understand that when their members succeed they also succeed and are focused on providing support and access to staff, which is where the free themes fall down in my experience. I didn’t wait too long after writing this review to upgrade all my sites to Thrive and I love it. These guys know affiliate marketing. They have produced the tools we all seek to build out our websites and have them all together instead of having to bolt on external plugins and widgets that may corrupt parts of your theme or not play well with other plugins you might be running. Thrive Themes membership is not the cheapest on the market, but it’s a long way from the most expensive and for what is included it gets my tick of approval. Plus don’t forget the membership price is frozen at whatever you pay today to join – you will never have to pay any more than you do right now. I hope you agree that the new look Rat Race Escape Project website looks pretty special and as I said I am only just scratching the surface when it comes to what Thrive can offer for my websites moving forward. I hope you enjoyed the Thrive Themes Review 2019 and that it helped answer your questions, but as always if you have any other thoughts or questions please pop them in the comments box below. Also if you are a Thrive Themes member let me know what you think of them or if you are using another Premium Theme you think our readers should look at please let us all know so the community can check it out. I did not realize they could cause actual issues, I just blamed it on me not knowing anything about the theme or how to play with it but I too had to go searching for different themes. I would find a perfect one but then the text is too close to the background image in color and nobody can read. Then I realize that it is about the reader and their ease of following not just what I envision. This review really helps in my search, thank you! Some of the free themes Alisha are pretty poor, having said that there are good ones out there but it might take a bit of trial and error as you say. The more plugins you add to try and get your theme to work or look how you want to more chances you have of introducing issues and slowing your site right down also. Not good for the user experience you are trying to improve. I absolutely loved my first free theme, it was easy to read, nice headers and looked pretty flash I thought. It’s just that it was slowing the whole site down and causing errors so it had to go. I am very happy with Thrive and have now converted all my sites over to it. It also means I can just learn the one program and become proficient in using that saving time and getting a better result on both mine and my client’s websites. When your ready for a Premium theme do give them a try, I highly recommend them. Well written and detailed. I like your honesty about what you have not used yet. However, I think it would be better if you were actually using the product. Your update says you now have signed up, so is what I am seeing your new site layout or the old you changed from? I like your site, clean, easy to read, well set up…is that for free or paid for. It also says there is a planned update July of 2018, did this happen? What are the new themes like? I have not had any problems so far with my free theme, but this made me want to sign up. Don’t understand the wordpress dot com vs dot org sites. That is also something that I can not log into my site from the wordpress app on my ipad…or at wordpress dot com. So I guess that means I use wordpress dot org. If you are in WA then mine must be the same as yours. Again, I really like the looks of the site. Just not sure if it is free or paid for. I will spend some more time looking around the rest of your site another time. Authors note: The blog has now been updated to reflect that I did purchase the Thrive Themes membership. Hi Tony what you are looking at now is the updated premium Thrive Architecture. I am running their theme called Pressive for this site now. I use another of their themes called Minus on my niche website which you can check out the look and feel of by clicking here. I do need to do a bit more work on this blog obviously to make it clearer. They are adding more themes to their stable shortly for you to choose from and every theme is so customisable that you can get it to look pretty much exactly as you like. So the bottom line is yes this site is now running on Thrive Architecture and using their theme called Pressive. Hope that helps clarify and my apologies for confusing you. To be honest with you, often I came across these Thrive Themes banners and people often promoting it and I use to think whether its worth the hype and promotions. Your post answered my question. 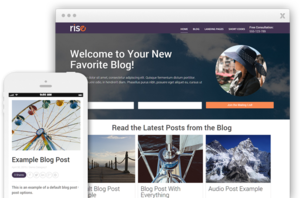 Thanks for sharing the benefits and advantages of Premium theme and I do have a free WordPress theme which causes some problem often. After reading your review and the benefits of Thrive Themes I am interested in going with them. Hi Paul I recently moved my niche site to Thrive Themes. It has about 80 posts and 10 pages, with a lot of shortcodes and additional plugins eg. product review, GDPR compliance, forms plug in. You name it this site has it. And not one thing didn’t move correctly or not work after installing the new theme. I was absolutely amazed. I’d been putting it off for months because I feared what it might look and work like once I’d done it and how much work it would be to get it all back functioning. I needn’t have worried at all as it turns out. I did create a new home page because the Thrive template was so much more modern, but apart from that it has not created any problems or additional work thus far. What I will do as time permits is to go through each blog and remove the plug in versions of things like forms. Because Thrive has them built in I can change the elements to the Thrive theme versions and then delete the plugin. This should make the site faster, less plugins to update constantly and less chance of bugs or issues with conflicting plugins in the future. I highly recommend it if you are considering a premium theme. Love it. Thanks a lot for your quick reply and I appreciate it. Thanks for your clarification and for sure gonna try The Thrive Themes. This is a timely article for me as I have been contemplating purchasing a theme. Up until now I’ve always used free themes, and have had good luck, but recently, I have been experiencing issues with my images. I can relate to how you feel. I’ve been looking at themes from StudioPress, but haven’t landed on one yet. Your post has inspired me to check out themes from Thrive. While I’ve certainly heard of Thrive themes, I haven’t actively pursued buying one. I particularly like the support you get with paid themes. I don’t have personal experience with this, but have heard from colleagues this is the case. Thank you! Hi Holly after a few months now of getting to know my Thrive Themes I absolutely love them. I am only scratching the surface with everything it can do and I still have a lot to learn. Another thing to consider is with the introduction of Gutenberg in the next day or two a block building editor like Thrive will mean you shouldn’t experience any disruption to your site. I have just moved my niche site over to Thrive also and the move was seamless. I had been putting it off because my niche site is my baby, it’s the first site I ever created and it has A LOT of content so I was worried. But every single post was fine, not one thing out of place and all links still working. All systems go. Best wishes on your premium theme choice and thank you for stopping by to comment. Thank you Heidi for that very informative review! much appreciated. great job! Hi Jane thank you for your comment. The more I research Thrive the more I NEED to have these tools. I have a couple of websites now and being able to buy the one membership and use it across all my site seems like a pretty good deal. The other thing I have been thinking is if I go with the one membership I can thoroughly learn just the one platform and get more out of all my sites rather than having different themes all acting slightly differently. Anyway more food for thought, thanks again for stopping by.